Today, the California Diamond Jubilee Commemorative Silver Half Dollar Coin remembers when George Vancouver sailed into the San Francisco harbor on November 14, 1792. My apprehensions of bad weather were not ill-founded; after a few hours calm we were again visited by a S. S. E. gale, attended as before with heavy rain; this soon reduced us to close-reefed topsails, and brought with it a very heavy sea. Soon after midnight the wind suddenly shifted to the westward, the sky became clear, and we again steered for the land; about nine in the morning of Wednesday the 14th we passed point de los Reys, which I found to be situated in latitude 38° 0′, longitude 237° 24′. This is one of the most conspicuous promontories southward of cape Flattery, and cannot easily be mistaken; when seen from the north, or south, at the distance of five or six leagues, it appears insular, owing to its projecting into the sea, and the land behind it being lower than usual near the coast; but the interior country preserved a more lofty appearance, although the mountains extended in a direction further from the coast than those we had lately noticed. From the south point of port Bodega, which is formed by steep rocky cliffs with some detached rocks lying near it, the coast makes a shallow open bay, which is bounded by a low sandy beach; towards the S. E. part of which the elevated land of point de los Reys again commences, and stretches like a peninsula to the southward into the ocean, where its highest part terminates in steep cliffs, moderately elevated, and nearly perpendicular to the sea, which beats against them with great violence. Southward of this point the shore, composed of low white cliffs, takes, for about a league, nearly an eastern direction, and there forms the north point of a bay extending a little distance to the northward, which is entirely open, and much exposed to the south and S. E. winds. The eastern side of the bay is also composed of white cliffs, though more elevated. According to the Spaniards, this is the bay in which Sir Francis Drake anchored; however safe he might then have found it, yet at this season of the year it promised us little shelter or security. The wind blowing fresh out of the bay from the N. N. W., I did not think it proper to lose this opportunity of proceeding with all dispatch to St. Francisco; where there was little doubt of our obtaining a supply of those refreshments which were now much wanted by the whole crew. Off point de los Reys are situated some rocks, called Farellones; those we saw were tolerably high, and appeared to be in two distinct clusters of three or four rocks each, lying in a S. E. and N. W. direction from each other. The highest rock of the northernmost group lies from the extremity of point de los Reys, S. 13 W., distant 14 miles; the southernmost S. 5 E., at the distance of 17 miles. From unquestionable authority I learned, that a third cluster of rocks, scarcely above the surface of the sea, lies 12.5 miles distant from the above point S. 36 W.
With a favorable gale and pleasant weather we sailed, at the distance of two or three miles, along the coast; which, from point de los Reys to port Francisco, takes a direction S. 62 E. distant eight leagues. At noon the observed latitude was 37° 53′, longitude 237° 35′; in this situation point de los Reys bore by compass N. 72 W.; the supposed bay of Sir Francis Drake N. 45 W.; a low sandy projecting point, off which some breakers extended nearly two miles to the E. S. E., being our nearest shore, N. 34 W., about a league distant; the southernmost land in sight S. E.; and the south-easternmost of the Farellones S. 35 W.; to the eastward of the low sandy projecting point, the coast suddenly rises in abrupt cliffs, with very unequal surfaces, presenting a most dreary and barren aspect. A few scattered trees were growing on the more elevated land, with some patches of dwarf shrubs in the valleys; the rest of the country presented either a surface of naked rocks, or a covering of very little verdure. We had approached, by two in the afternoon, within a small distance of the entrance into port St. Francisco, and found a rapid tide setting against us; the depth of water regularly decreased from 18 to 4 fathoms, which appearing to be the continuation of a shoal that stretches from the northern shore, then distant from us not more than a league, I hauled to the S. W. in order to avoid it, but did not succeed in reaching deeper water, as the bank we were upon extended a long way in that direction, as was evident from the confused breaking sea upon it, and the smooth water on either side of it. We therefore made for the port, and soon increased the depth of water to eight and ten fathoms, until we arrived between the two outer points of entrance, which are about two miles and a half apart, and bear from each other N. 10 W. and S. 10 E.; here we had 15 and 18 fathoms water, and soon afterwards we could gain no sounding with a hand-line. Although favored with a pleasant breeze which impelled us at the rate of four or five knots an hour, it availed us no more than just to preserve our station against the ebb setting out of the port. We did not advance until four o’clock, and then but slowly, through the channel leading into this spacious port; lying in a direction N. 61 E. and S. 61 W.; it is nearly a league in length, with some rocks and breakers lying at a little distance from either shore. Those on the southern side were furthest, detached, and most conspicuous, especially one, about a mile within the S. W. point of entrance, which seemed to admit of a passage within it; but we had no opportunity of ascertaining that fact, nor is it of any importance to the navigation, as the main channel appeared to be free from any obstruction, and is of sufficient width for the largest vessels to turn in. Its northern shore, composed of high steep rocky cliffs, is the boldest; the southern side is much lower, though its south-eastern point is formed of steep rocky cliffs, from the base of which a tract of sandy country commences, extending not only along the southern shore of the channel, and some distance along the exterior coast to the southward, but likewise to a considerable height on the more elevated land that borders thereon; and interspersed with huge massy rocks of different sizes, which, with the Farellones, render this point too conspicuous to be mistaken. Having passed the inner points of entrance, we found ourselves in a very spacious sound, which had the appearance of containing a variety of as excellent harbors as the known world affords. The Spanish establishment being on the southern side of the port, our course was directed along that shore, with regular soundings from nine to thirteen fathoms. Several persons were now seen on foot and on horseback coming to the S. E. point above mentioned; from whence two guns were fired, and answered by us, agreeably to the signal established between Senor Quadra and myself. As the night soon closed in, a fire was made on the beach, and other guns were fired; but as we did not understand their meaning, and as the soundings continued regular, we steered up the port, under an easy sail, in constant expectation of seeing the lights of the town, off which I purposed to anchor: but as these were not discoverable at eight at night, and being then in a snug cove, entirely land-locked, with six fathoms water and a clear bottom, we anchored to wait the return of day. 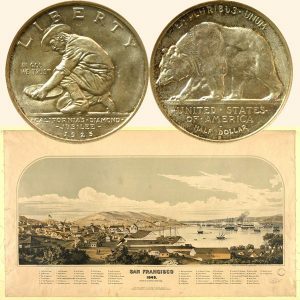 The California Diamond Jubilee Commemorative Silver Half Dollar Coin shows with an image of the San Francisco harbor, circa 1849.